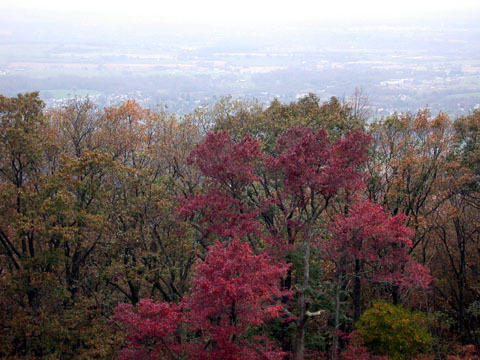 View from High Knob at Gambrill State Park in Frederick County. Frederick City Municipal Forest and Crampton's Gap are usually visible from here, but as you can see, visibility was not at its finest. 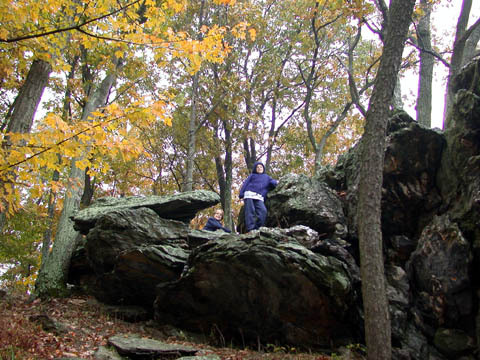 The kids love to climb the cliffs surrounding the stone teahouse at High Knob. The first time I was ever at this park, someone my husband worked with had reserved the teahouse and it was very similar weather, perhaps even a little colder; there was a fire in the fireplace inside and the smell of wet leaves. We stood out on the gorgeous balcony until we were freezing, then went in and ate chili and warmed up. 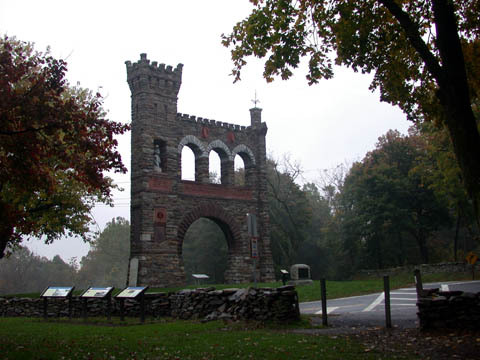 The Washington Monument at Washington Monument State Park four miles from Boonsboro. 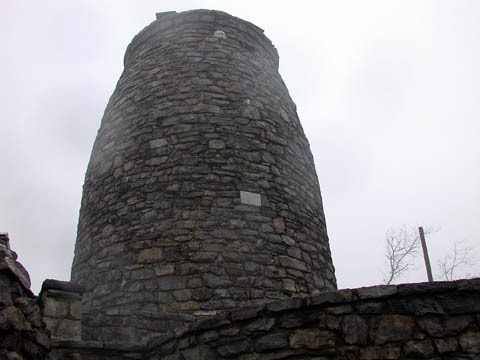 This 1827 stone tower is at the top of a hike marked by milestones from Washington's life, crossing the Appalachian Trail. 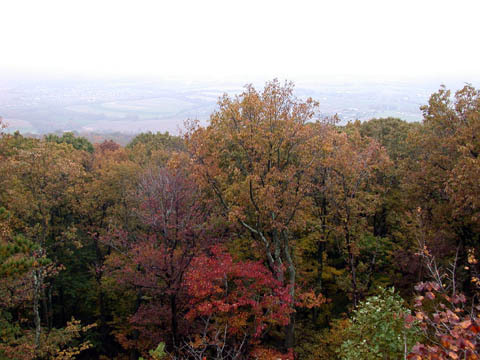 On a clear day, you can see West Virginia and Pennsylvania from the top. 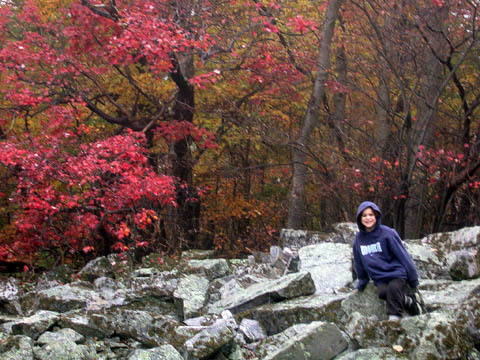 The day we went in 2004 was not such a day, in contrast to 2003, when we saw this fall color above Boonesboro. Instead the view looked like this -- treetops, and then a vast whiteness where one would have expected fields, hills and forests to the horizon, as in this photo from last year. 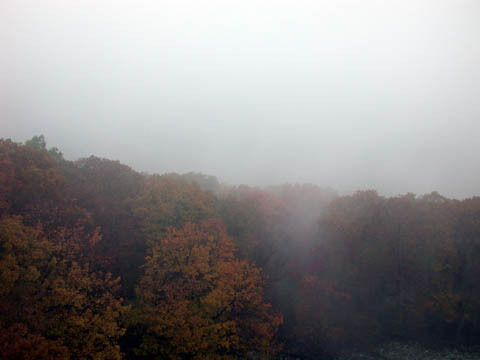 The leaves, however, were undiminished by the fog and rain. 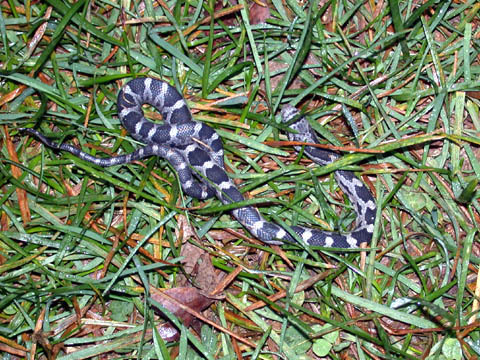 And there was a snake at the foot of the monument, though the hundreds of thousands of ladybugs that swarm over it in late summer were gone. 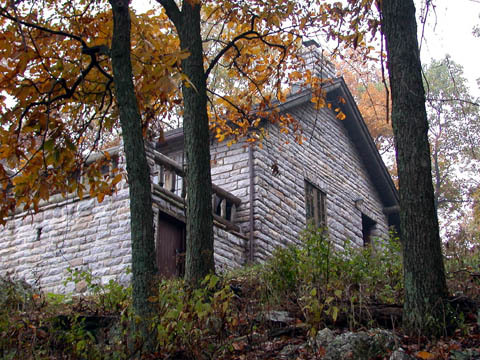 Gathland State Park, of particular interest to Civil War history buffs as the southern extremity of the battle of South Mountain was fought here. 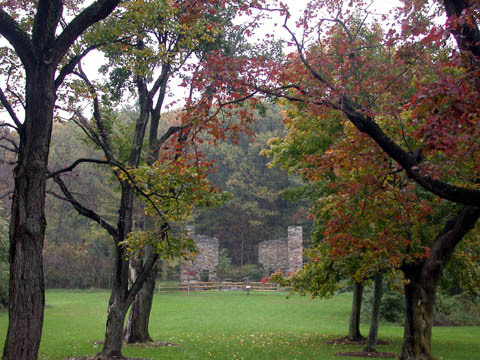 "Gath" was the pseudonym of George Alfred Townsend, a Civil War journalist who had a home here, the ruins of which can be seen through this line of trees. Some of the other buildings on the estate have been restored, like the one on across the street which houses the little Civil War museum, but not this one. Here is the War Correspondents Arch, which is in magnificent condition -- the names of all the journalists honored on it are quite visible on the plaques. There is a walk-through tour of the battlefields and it's not far to the church featured in The Blair Witch Project in nearby Burkittsville.